The 53rd Girl Scout National Convention is just a week away!! One of the highlights is always the super shop, with hundreds (thousands?) of Girl Scout goodies. Of course, any mention of official Girl Scout products inevitably leads to complaints that the handbooks, badges, etc. cost too much. I’m going to go out on a limb here and say that I have no problem paying for Girl Scout books. Junior Technology, the first online badge, was introduced in 1997. Today’s Girl Scout can’t find any requirements online without breaking the law. Let’s be honest and fair and admit that distributing bootleg scans of journey books and badge requirements constitutes theft. It is taking a person’s hard work without paying for it. Go ahead, argue “sharing” and “sisterhood” all you want, but if thieves share stolen goods among themselves, it does not make the theft acceptable. Would you walk into a Girl Scout shop, pocket a handful of badges, and walk out without paying? This is no different. Let’s resolve to respect authority, including copyright law. The bootleggers know they are breaking the law, which explains why they try to shout down anyone who calls them out with nasty comments and name calling. Do we really have to put labels on every page, photo, design, etc. saying “Not yours. Don’t steal”? I agree that the current program materials are a bit pricey, but I also realize that buyers are shouldering the cost of sales lost to illegal download sites. I don’t think the Girl Scout way is to sneak around and try to subvert the system. Instead, let’s ask GSUSA to make program publications available digitally for legal, inexpensive downloading. The Boy Scouts already make many of their badge guides available through Amazon Kindle. Would you pay $1.00 for a PDF of a badge insert? Perhaps $5 for a digital journey book? Sign me up. Tell GSUSA that you’d like to legally download publications for your troop. I’ve started a Facebook page for people who like this idea: Girl Scout Publication PDFs Please. Nation’s Capital has a copy of the Trefoil Patent application. I think our founder would approve of this proposal. 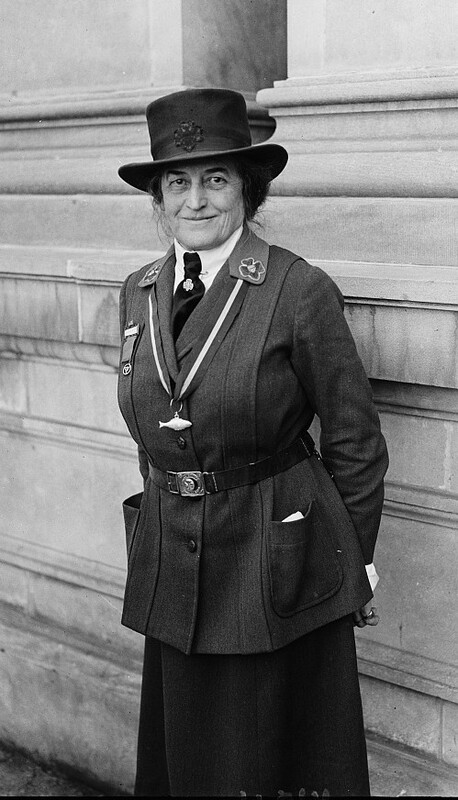 Juliette Gordon Low understood the importance of intellectual property rights and secured a patent for the trefoil symbol. 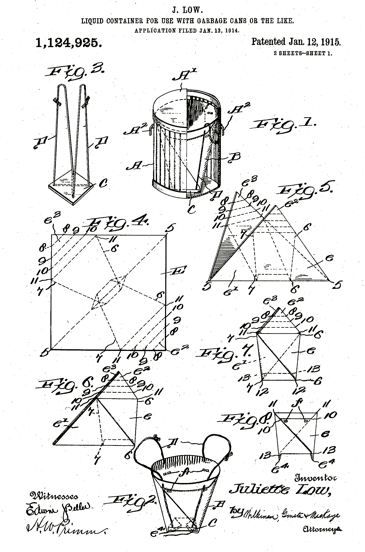 She applied for the patent on November 23, 1913, and received it on February 10, 1914. 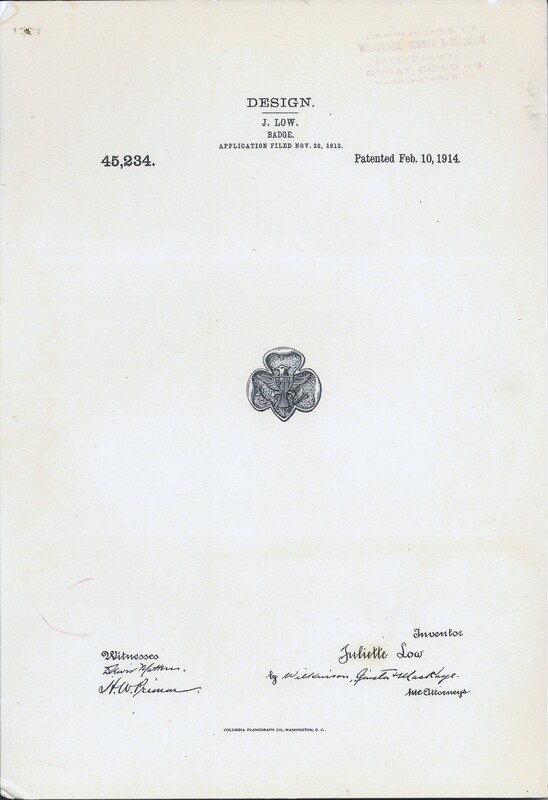 When Low decided to step down from the day-to-day operations of Girl Scouting in 1921, GSUSA asked that she surrender the patent to the organization. She agreed, but on her own terms. Stacy Cordery, Low’s recent biographer, recounts how Daisy shrewdly agreed to assign the patent to GSUSA in exchange for keeping her name on the organization’s Constitution, stationery, and membership cards in perpetuity. Daisy actually had two patents. The other is for the “Pluto Bag,” a stand-up trash bin for liquids. It reminds me of an origami project that got way out of control. Want to learn more about intellectual property? 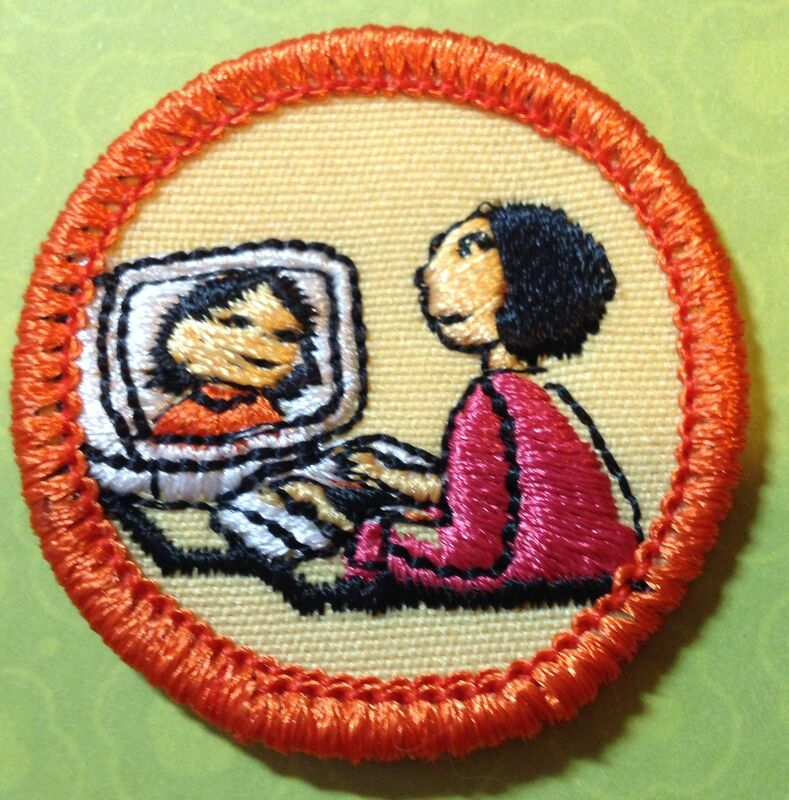 The Girl Scout Council of the Nation’s Capital has a their own intellectual property patch program for all age levels. The GSCNC Archives received an unexpected treat at our April 13, 2013, Annual Meeting. Council President Diane Tipton had recently returned from a visit to her childhood home, where she ran into an old neighbor and friend. 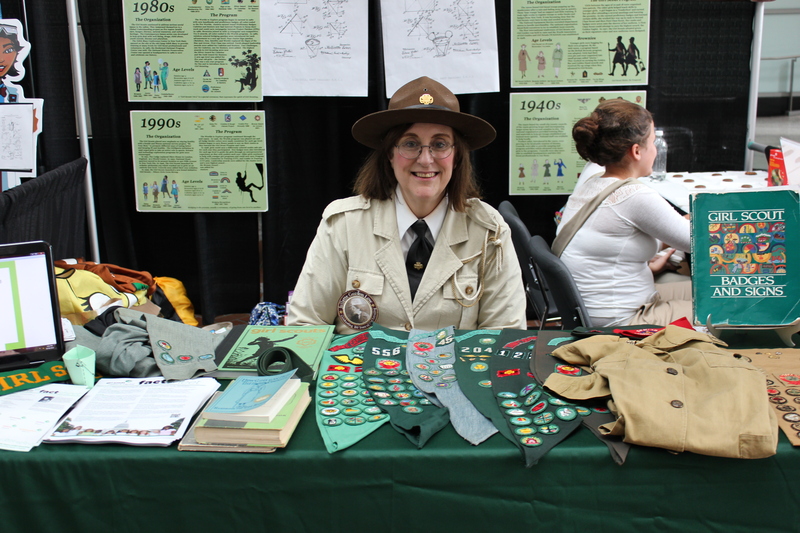 He’s an avid collector of Boy Scout memorabilia who had also accumulated some Girl Scout items over the years. When he heard how involved Diane still is in Girl Scouting, he wanted her to have his Girl Scout items. Diane then presented them to the committee. 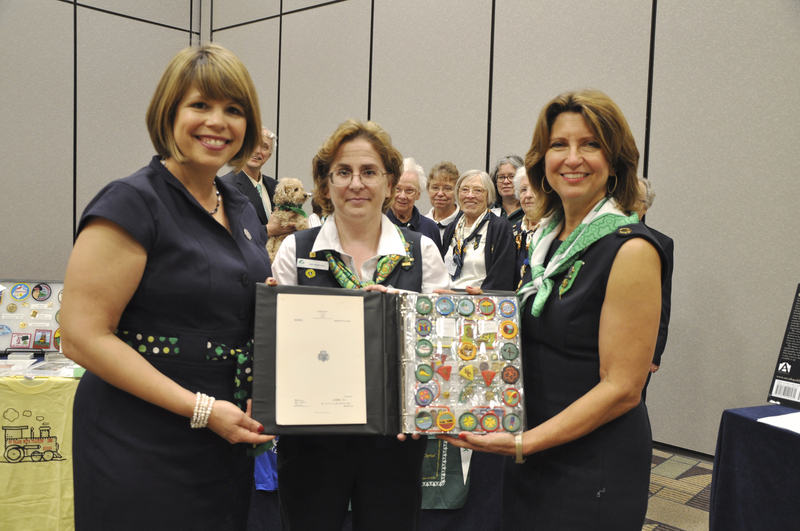 Along with pins, badges, and a handbook, the donation included a copy of Juliette Gordon Low’s application to patent the trefoil symbol. She applied for the patent on November 23, 1913, and received it on February 10, 1914. Our donation includes the signature page; the original, two-page document is held at the Juliette Gordon Low Birthplace in Savannah, Georgia. Daisy actually had two patents. The other is for the “Pluto Bag,” a stand-up trash bin for liquids. It reminds me of an origami project that got way out of control! In honor of our founder’s two patents, GSCNC has been an exhibitor at the annual U.S. Patent and Trademark Expo held at the Patent Office in Alexandria, Virginia, each fall. Last year we had directions for the trash bin at our booth, and dozens of girls and adults valiantly tried to make one. The trefoil patent application will certainly be part of our booth display at the next Patent and Trademark Expo this fall. Who knows, perhaps “Daisy” will make make another surprise visit to our booth this year!